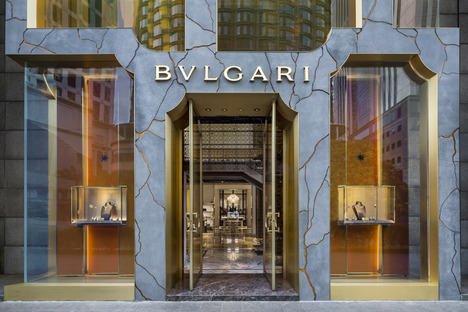 The architects from MVRDV were called to reinvent the façade of the Bulgari shop in Kuala Lumpur, so as to create continuity with the historical shop in Rome, while at the same time being innovative, yet in line with the spirit of the famous jewellery brand. 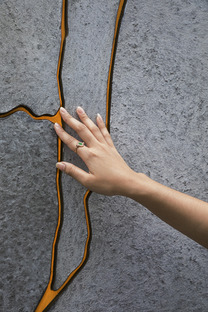 Inspired by the shop in Rome, with its historical grey and green veined marble frames, a material that also appears in the internal design architectural components, the designers collaborated with the Delft University and Italian company Tensoforma to create a solution that could respond to a new image. And they realised it. The structure, protruding from the profile of the building, is covered by GRC panels fixed to the building by suitably designed and realised steel profiles, following the techniques used for ventilated façades. 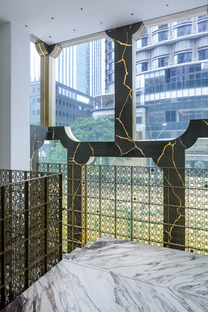 Each panel was designed and realised following a unique design, and then installed at a very close distance from the other panels, this way creating a net of grouts completely free from one another. 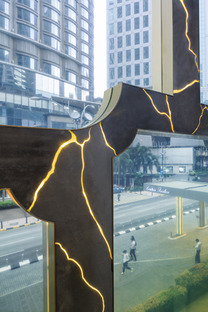 The objective was to imitate the veins of the marble of the Roman shop in a newer, more technological, version. 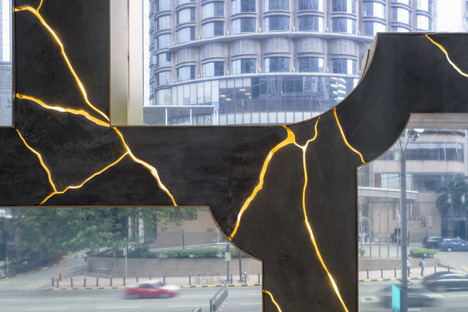 A specifically designed resin was then used, based on the design needs, to fill within the GRC so as to enhance the effect of the nearby installed LEDs. 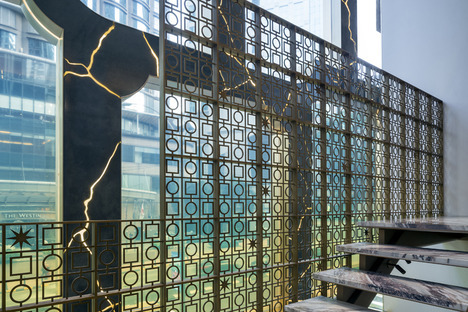 This way, a final effect is generated that recalls the veins of the marbles which appear to be pleasantly golden during the entire day, and that are very shiny during the night. This creates a hypnotic, seductive effect which only apparently seems to be unrelated with the brand. In actual fact, this new façade blends with the brand in such an iconic way, that it can be replicated all over the world.